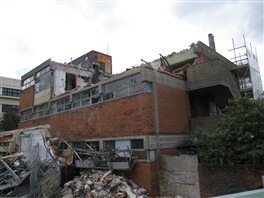 On Sunday 9 May 2010 I drove down Morning Lane and saw that the fate of the former LBH Training Centre had been made in advance of a decision from English Heritage. With no planning applications submitted to Hackney Council the demolition could have easily waited for the outcome of the spot listing. Here is the reason why the Hackney Society wanted to see this building saved. In 1959 the Mental Health Act devolved care for the mentally ill to local authorities, and in 1963 the Department of Health published a Building Note encouraging the provision of local training centres and setting out the standards and financial allowances available. In the following year Hackney Council began work on the construction of a Training Centre for Adults with Learning Disabilities at 205a Morning Lane. Designed by Stillman and Eastwick-Field (SEF) the building, like many other examples of their work, is elegant, well proportioned and meticulously detailed. 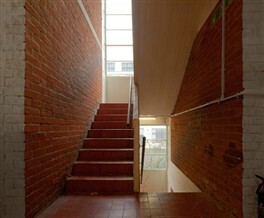 Possessing a strong character – with its concrete edge beams, escape stairs and flues, projecting glazed lift and stair tower (with the affectation of opening lights distinguished in a different colour), red brick panels and eau-de-nil spandrels – the design is as formal an assembly of architectural elements as any Palladian villa. Brutalism hardly seems the right word to describe such an elegant example of an increasingly rare species of post-war building. 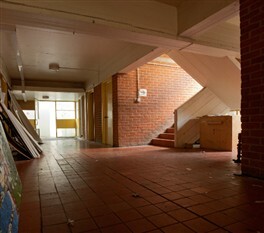 Today, the LBH Training Centre stands empty and forlorn – waiting to be demolished by Hackney Council. In its place a new school campus is planned for Cardinal Pole RC Secondary School, which is currently split across two sites. This project is to be funded by the Building Schools for the Future programme, a Government initiative which has controversially seen the demolition of many perfectly adaptable buildings across the UK. Jestico Whiles architects have been appointed to design the school, with early designs recently presented to the Hackney Design Review Panel in March 2010. At the Review Panel the architects made no reference to whether they had considered retaining the former LBH Training Centre, or indeed the former Berger paint factory next door. 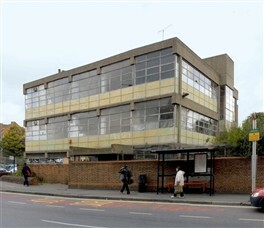 The Hackney Society would like to see the LBH Training Centre integrated into the new school campus, as it seems profligate to demolish this building – both economically and culturally. 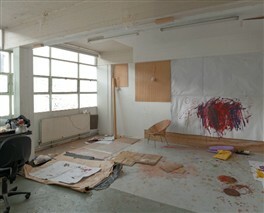 The LBH Training Centre was closed in 1970, but Hackney Social Services continued to occupy the building until 1999 when it was then leased to Space Studios – an arts charity that rents studio spaces to artists – up until March 2010. Due to a history of short leases and under investment the building currently looks tired and shabby, but underneath the graffiti and faded exterior is an architecture that demonstrates a confluence of social purpose and avant-garde design, complete and largely unspoiled. Unusual features, such as a diagonally set porch, could be carefully conserved and adapted to modern requirements. 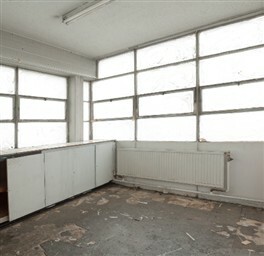 With some imagination the building could be transformed to provide excellent workshops for art, technology or science. John and Elizabeth Eastwick-Field, and John Stillman met as students, in 1937, at the Bartlett School of Architecture; and in 1949 set up a practice together. By the 1960s, Hackney Council, like most local authorities, had recruited teams of architects, like Stillman and Eastwick-Field, to deliver the very large housing, education and health building programmes, which were in train. Many of the brightest students emerging from the Architectural Association, The Bartlett, Liverpool and other schools had been attracted not only by the volume of work, but – for those on the left – a commitment to post-war public sector building programmes. And this was matched by a new architecture. In 1955, only half a mile away on Hartlake Road, the LCC Architects’ Department had built Vaine House and Granard House in a style, which – though it clearly had its origins in the work of Le Corbusier in France – was to become identified with local authorities in Britain. The style was defined by the historian Reyner Banham, in his essay The New Brutalism in 1955 as “the clear expression of structure and valuation of the materials as found”. In the event the buildings came to be characterised by concrete frames struck from carefully selected boards, exposed brick and timber panels, metal windows and patent glazing. The supposed economy achieved by stripping away redundant finishes and decoration and the clear relation of the form to the use of the building, rather than any stylistic stereotype, appealed to public sector bodies operating within closely prescribed budgets. In practice the supposed savings were not always realised. The care in detailing and manufacture, and the high quality of materials required to achieve the required standard, often offset any cost efficiencies. During their career Stillman and Eastwick-Field managed to make their mark with award-winning designs that were often published in the national architectural press. They also had a respect for conserving existing buildings with many of their school designs integrating buildings from former periods. Today they are largely remembered for their role in the rebuilding of Britain in the post-war years, providing well-considered, beautifully crafted designs. It should also be noted that the practice was committed to education. The rebuilding of the Camden School for Girls, in 1957, was one of their boldest achievements in the educational sphere, although their best work was undoubtedly the Residential School for the Partially Sighted in Exeter. In Hackney, they designed Stoke Newington Secondary School in Clissold Road (1967-70), which was recently submitted for statutory listing, but failed. Also, in the 1950s, John Eastwick-Field was a tutor at the Architectural Association, where he taught an experimental course on practical building, and later was elected its president. While many of their buildings are mentioned in Pevsner’s The Buildings of England architectural guides none have been statutorily listed, despite attempts by the Twentieth Century Society. It would be a fitting tribute to their vision and expertise if the LBH Training Centre was listed Grade II, and integrated into the proposals for Cardinal Pole Secondary School – something which was at the heart of their practice. This page was added on 27/03/2010. I really like the aesthetics of this building even though it is in dire need of restoration, hopefully it will be saved, renovated and put to good use; artists' studios seems quite appropriate for it. It is very sad for all our artists to see it go, we would love to reoccupy if we had the chance. It has been up for demolition for some time but is in good shape beyond the need for a lick of paint. It's an excellent workshop building. I live close by this building and have always admired it, as well as the ex-Berger paint factory. Via these pictures I am very interested to see the interior,which looks so airy and bright. I do hope that it will be saved.We have been blighted by so many badly designed new buildings in Hackney, we should hang on to some of the good old ones. Very sad to see this original building disappear. I always liked its bold and uncompromising geometry. Will be missed. I am somewhat bemused to be reading this on the Hackney Society website following a number of run-ins with Hackney's planning committee leading to formal complaints about behaviour, bias, process and proceedures. In many instances Hackney Council claim to defer to bodies such as the Hackney Society yet in all too many cases any voice or opinion from this body appears sadly lacking. Hackney Council treat this silence as a permission granting process to do what they wish. Perhaps as a society you have opted for the softly-softly approach, if so, it has failed you and failed the community. Hackney now ride roughshod over the opinions of the community, residents and council tax payers with what amount to often misleading and sham consultations on buildings and projects, where systemic abuses of process seem to be the norm. 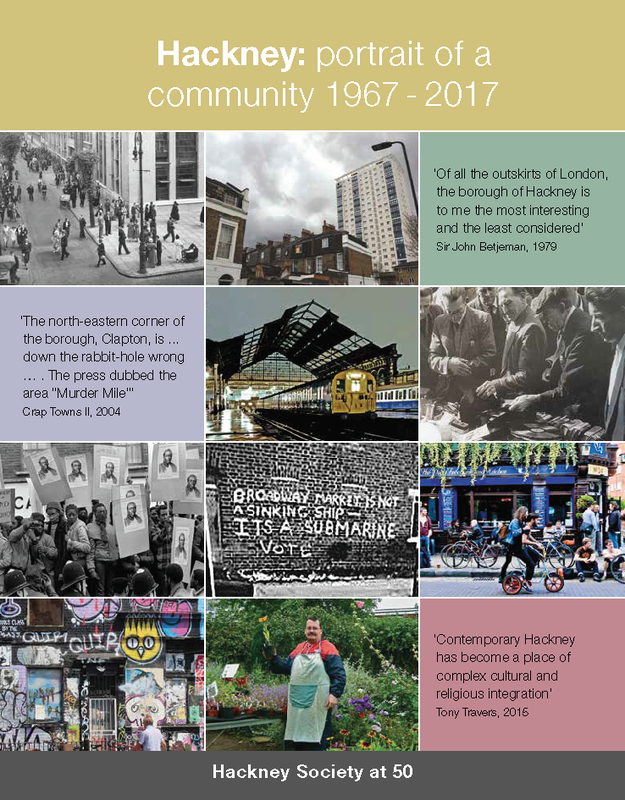 There is now, more than ever a need for a more strident and militant voice from bodies such as the Hackney Society and indeed, any other emergent bodies, to try and control the council and some of their clear and apparent failings wiht regards planning and development.